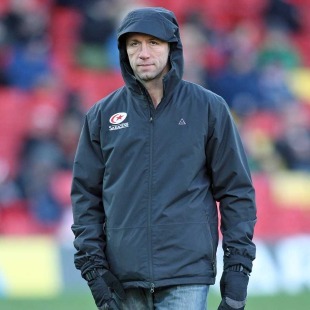 Former Saracens boss Brendan Venter has admitted that although tempted by the England role he will not be applying for the vacancy at the Rugby Football Union. Venter returned to South Africa last season citing family reasons and although he admits it would be a very attractive role, the reasons he left Saracens in the first place have not changed. Instead, he believes the right man for the role is Northampton Saints head coach Jim Mallinder. "I see that I have been linked with the job and I must admit that it is flattering," Venter said in his column for the Daily Telegraph. "It is one of the top five rugby jobs in the world and anyone with an ounce of ambition would take it in a heartbeat. "But the family situation that meant I had to leave the Saracens job has not changed, so I'm not in a position to leave South Africa, however tempting the role is." Venter is no stranger to the Saints having managed his Sarries side against them in the past couple of seasons and the South African is full of praise for Mallinder's management ability. "Jim Mallinder is the right man for the England job because he is the only one of the candidates who is a classic head coach prepared to get his hands dirty and build a team from scratch," Venter said. "He did this at Northampton when he took the club from the first division to the Heineken Cup final in less than four years, and I believe he can make England one of the most difficult teams to beat in Test rugby. "But if Mallinder is to be the success I know he can be he must be allowed to pick his own coaching team. Northampton have become such a good team because of the chemistry between Mallinder, West and Paul Grayson. If he wants to work alongside these men for England then the RFU must let him. "It is impossible for a head coach to go to war with people he hasn't worked closely with over a long period. The problem Johnson had was that he hadn't coached before so he had none of his own colleagues to appoint. "If the RFU ever appoints Sir Clive Woodward to the vacant elite performance director role, I could see him really complementing Mallinder. Woodward would bring a creative element to the set-up, leaving Mallinder to concentrate on making England the best prepared and most dedicated team possible. "Working with the RFU will not be easy for Mallinder and if he wants a soft job then he should not apply for the role. He has served his apprenticeship in the English game and he is the only man with all the right credentials for the job. If Mallinder is not a success then it must be because the English talent pool is not as good as we all think." And Venter's sentiments have been echoed by Sale boss Steve Diamond who has also given his backing to the Northampton Saints man. "I think he's the man. He's got a great track record at Northampton and Sale and did a good job with the Academy so Jim's the right man for the job I believe," Diamond told the Manchester Evening News . "He's a good bloke. He understands the game very well at the highest level and he also played at the highest level. "He's got 15 years' experience to offer and he knows about a lot of the background that goes with England having worked with the RFU. I think he would be very good."